Wyandotte County – Page 1647 – Welcome to Wyandotte Daily! Calm, cool weather is expected for Tuesday and Wednesday, followed by a cold front with a chance of storms on Thursday. Today’s high will be 72 with partly sunny skies, the National Weather Service said. The Tuesday night low will be around 56. Wednesday’s forecast is much the same, with a high of 72, according to the weather service. The weather will change on Thursday, the weather service said. Showers and thunderstorms are expected to accompany a cold front as it sweeps through the region on Thursday, according to the weather service. 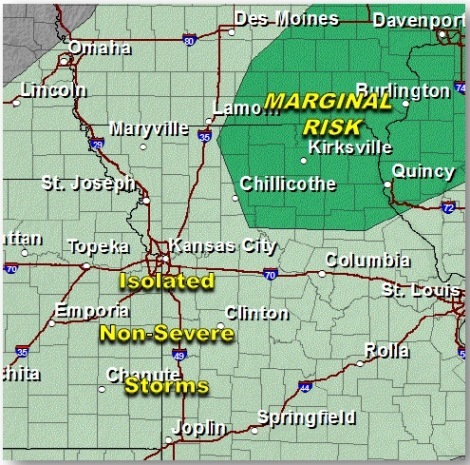 A few storms could reach far northwest part of the region late Wednesday night. Forecasters are not expecting a lot of storms but a few of the stronger ones could produce marginally severe hail over parts of the region, according to the weather service. The chance of rain is 40 percent on Thursday, and the skies will be partly sunny with a high near 80, the weather service said. Thursday night, there will be a 30 percent chance of rain with a low of 53, according to the weather service. Friday, it will be mostly sunny with a high of 66, according to the weather service. Friday night’s forecast is partly cloudy with a low of 57. On Saturday, it will be mostly sunny with a high of 72, the weather service said. Saturday night, the low will be 57. On Sunday, expect sunny skies with a high of 81, according to the weather service. After more cool and dry weather today, with a high near 66, the weather changes again, warming up a little on Tuesday, the National Weather Service said. After three days with temperatures in the 70s, the mercury will fall again on Friday, according to the weather service. A cold front moving through the region will bring a chance for a few storms to the region late Wednesday night and Thursday, the weather service said. Any thunderstorms that develop are not expected to be severe. Tonight’s low will be around 54, according to the weather service. On Tuesday, skies will be partly sunny with a high of 73, the weather service said. Tuesday night, it will be partly cloudy with a low of 58. Wednesday, expect a high of 79 with partly sunny skies, and Wednesday night, a low of 63, according to the weather service. On Thursday, the high will be near 78, with a 50 percent chance of showers and storms, the weather service said. Thursday night, there will be a 30 percent chance of precipitation with a low of 53. Friday, temperatures drop to a high near 66, and there will be mostly sunny skies, according to the weather service. Friday night, there will be a low around 48. On Saturday, expect mostly sunny skies and a high near 70, the weather service said. Saturday night’s forecast is mostly clear with a low of 55. Sunday, it will be sunny with a high near 78, according to the weather service. The third time proved a charm for Ed McFadden and Dave VanDerwell in Kansas City’s oldest and biggest senior golf championship. 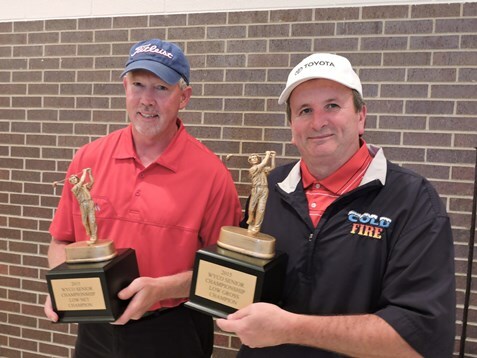 McFadden took low score honors with a one-over-par 73 and VanDerwell had the low net of 64 to lead a field of 111 golfers in the 32nd annual Wyandotte County Senior Championship at Sunflower Hills Thursday. Both were playing in the tourney for just the third time and both are 60. McFadden needed a scorecard playoff for low gross honors, edging veteran Bob Chatterton by virtue of a par on the monstrous par 4 15th hole. “A driver and 6-iron,” said McFadden of reaching the 442-yard hole in two. A 1972 graduate of Bishop Ward, McFadden has been playing Sunflower Hills since it opened and has become a regular in the men’s senior league. “I’ve been in the upper 60’s, 68, 69,” said McFadden, the sales manager for Jay Wolfe Toyota and a 25-year member of the sales staff for Jay Wolfe auto dealerships. The senior tourney couldn’t have come at a better time for VanDerwell. A retired teacher from Argentine Middle School and the Olathe school district, VanDerwell also plays in the Kansas City Senior Golf Association and a 9-hole league at Overland Park. At 82 years of age, Clarence Nigh came closest to shooting his age with an 84. Flight winners for low gross included Bill Campbell, Glenn Rice, Tim Francis, Dave Klein, Chatterton and Nigh while low net flight winners were Jay Sutera, Steve Briles, Gary Hudgens, Keith Marr, Dave Davis and Joe Dercher. SENIOR KIDS (55-60) – 1. Bill Campbell*, 75; 2. Tim Skorija, 75; 3. Keith Forrest, 79; 4. Ray Loya, 80. NET – 1. Jay Sutera, 66; 2. Greg Schmidt, 67; 3. Mike Sharp, 69; 4. Jim Long, 70. FRESHMEN (61-63) – 1. Glenn Rice, 76; 2. Tom Bachelor, 77; 3. Joe Carrillo, 78; 4. John Stege, 81. NET – 1. Steve Briles*, 67; 2. Dan Schmit, 67; 3. Rick Paulsen, 69; 4. Byron McCallum, 70. SOPHOMORES (64-66) – 1. Bob Chatterton, 73; 2. Ron Wilson, 78; 3. Bob Jeselnick, 79; 4. (tie) Steve Burke, Bob Janesco, 80. NET – 1. Gary Hudgens*, 68; 2. Ted McClellan, 68; 3. (tie) Ron Medley, Mike Romine, 69. JUNIORS (67-71) – 1. Tim Francis, 76; 2. Chris Blum, 77; 3. Jorge Prieto, 81; 4. Richard Evans, 82. NET – 1. Keith Marr, 67; 2. Tom Vrabac, 68; 3. (tie) Stewart Nelson, Glen Richard, 71. ADULTS (72-76) – 1. Dave Klein, 79; 2. Bill Palmer, 81; 3. Paul Palmer, 82; 4. Richard Johnson, 85. NET – 1. Dave Davis, 67; 2. Kermit Boyer, 70; 3. Dale Moore, 73; 4. (tie) Tom Cooley, Bob Tranckino, 74. SENIORS (77 and over) – 1. Clarence Nigh, 84; 2. Bob Stephan, 85; Bob Smith, 86; 4. John Smarekar, 88. NET – 1. Joe Dercher, 65; 2. Armando Diaz, 71; 3. Gail Eigenan, 72; 4. Jerry Savner, 73. PROXIMITY PRIZES – Closest to hole: Clarence Nigh, No. 4; Bill Pavlik, No. 8; Gary Hudgens, No. 13; Jim Long, No. 16. Longest putt: Bob Stephan, No. 9. Closest to hole on second shot: Byron McCallum, No. 10; Dennis McWilliams, No. 18.